Often people tend to use multiple Skype accounts due to various reasons one of them is they want to have segregated accounts for personal and professional use. 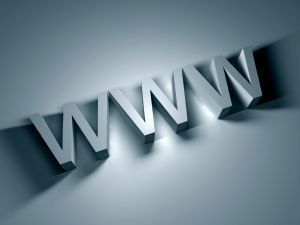 For example, bloggers like me often use one instance to manage list of friends, family members and important people in their life, while second instance is being used to manage important business contact and prospective. Such segregation helps in maintaining personal and professional relationship more conscientiously. Let’s not delve too much into the reasons why would someone have multiple accounts on Skype or other services. 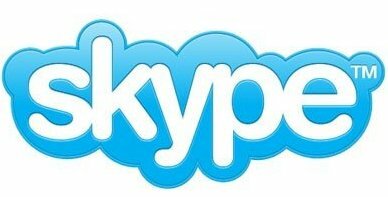 Skype is a popular VoIP software affluently used by Home users and business person for plenty of reasons. It is especially used to manage meetings, video conference and other video calling functions. It does offer fundamental text message service along with voice call service. The question which arose in my mind is, how would one manage multiple instances of Skype if they had more than one accounts? The same question must be bothering you as well, of course, that is why you’re here. Without further ado, let’s jump to the solution. The obvious and non-techy rather inane approach would be to log out from current account and switch to other account. This switching back and forth from one account to another account is impractical approach and often not preferred as there is no way to chat with multiple account simultaneously. 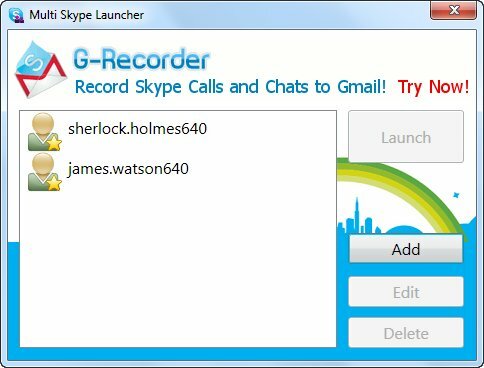 Multi Skype launcher is a ubiquitous application that will resolve the latter part. The cunning way to open more than one account simultaneously is multi Skype launcher. 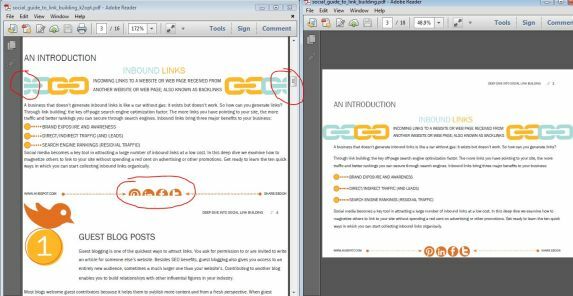 It eliminates all the acute process you might have to implement if you decide to take control in your hands by managing program files yourself. Download the application from above link and run it. Now enter your Skype login credentials to add an account, similarly, multiple accounts can be added by providing necessary information. It does let you edit or delete your accounts if you wish not to use them. Luckily, there are no advance settings to play with. All you have to do is select appropriate account from the launcher and hit on ‘Launch’ tab and it will open up a respective account for you. Make sure you un-tick ‘Start Skype when I start Windows’ option from General settings. Are you looking for a portable solution? Calimero is another application similar to multi Skype launcher, but for portable app users. It works for the Skype 5.3.0. The developer has stopped providing more support for this tool. However, the tool still works for old version of Skype. The best part is that it lets you add virtually unlimited accounts. Since it is a portable application, you do not need to install it. Skype launcher is yet another app in this category. By this time you know the drill. However, unlike other applications, it comes with heaps of other options that will make multiple Skype accounts handling job tad easy. 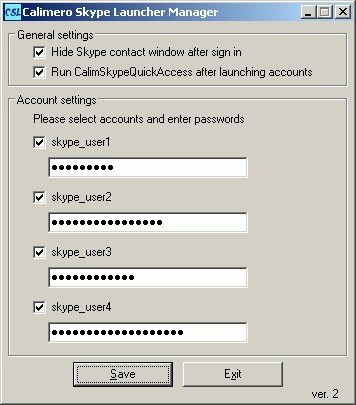 Some of the options like ‘Disable Sign Me In When Skype Start’ and Use alternative login helps a lot to less savvy people. Overall, Skype launcher is yard or two ahead of other application in its category. However, you’ve to cope up with annoying donation messages and adverts. Have you come across similar apps like above? Share your experience with handling multiple Skype accounts on your PC.